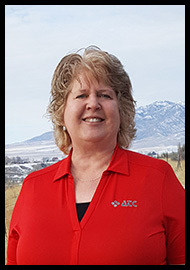 Julie Williams, our customer service representative in Malad City, has been with ATC since 2016. Julie loves taking care of customers and has a smile and solution for everyone she comes in contact with. Julie moved to Malad from Northern California in the early 90’s and has held a variety of jobs since the age of 16. Some of the jobs include being a firefighter, Department of Forestry dispatcher, cake decorator, and a short order cook. Julie enjoys helping her husband with their ranch and tackling craft ideas from Pinterest. Her many years of experience working with various community organizations, including the Chamber of Commerce, have coined her ATC’s “Community Cornerstone.” We’re delighted to have this hard-working, lobster-loving, go-getter on our ATC team!